ab12209 is strongly blocked in Western blotting on histones by tri methyl K4, weakly by di methyl K4 and very weakly by mono methyl K4 peptides. It is not blocked by non-modified peptides. By ELISA the antibody binds to the tri methyl K4 peptide and at high antibody concentrations to di and mono methyl K4 peptides. It does not bind to unmodified, mono, di or tri methyl K9 or di or tri methyl K27 peptides. Not suitable for blocking with milk in Western blot (see Application notes). Synthetic peptide within Human Histone H3 aa 1-100 (tri methyl K4) conjugated to Keyhole Limpet Haemocyanin (KLH). The exact sequence is proprietary. This antibody gave a positive signal in methanol fixed/Tween permeabilised HeLa cells within Flow Cytometry. Our Abpromise guarantee covers the use of ab12209 in the following tested applications. WB Use a concentration of 1 - 5 µg/ml. Detects a band of approximately 17 kDa (predicted molecular weight: 15 kDa).Can be blocked with Human Histone H3 (tri methyl K4) peptide (ab1342). NOT SUITABLE for blocking with milk. Block in 5% BSA for 1 hour. 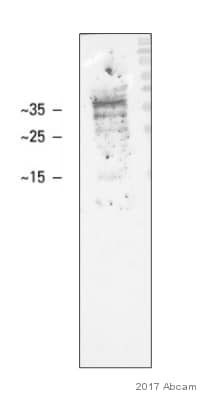 Our labs have investigated the blocking conditions for this antibody and found that milk significantly decreases the signal and is therefore not a suitable blocking agent for this antibody (see Western Blot image). Chromatin was prepared from U2OS cells according to the Abcam X-ChIP protocol. Cells were fixed with formaldehyde for 10min. The ChIP was performed with 25 µg of chromatin, 2 µg of ab12209 (blue), and 20 µl of Protein A/G sepharose beads. No antibody was added to the beads control (yellow). The immunoprecipitated DNA was quantified by real time PCR (Taqman approach). Primers and probes are located in the first kb of the transcribed region. Immunocytochemistry/ Immunofluorescence - Anti-Histone H3 (tri methyl K4) antibody [mAbcam12209] - ChIP Grade (ab12209)Image from Huh YH et al., Cell Death Dis 4(5). Doi: 10.1038/cddis.2014.522. Ab12209 staining Histone H3 (Tri Methyl K4) in Mouse hair follicle DSCs by ICC/IF (Immunocytochemistry/Immunofluorescence). Cells were fixed with 3.7% paraformaldehyde, permeabilised with 0.2% Triton X-100 and blocked with 10% normal goat serum in PBS. Samples were incubated with primary antibody at 1:200 dilution. An Alexa Fluor ® 568 conjugated goat anti-mouse IgG was used as a secondary antibody. ICC/IF image of ab12209 stained human HeLa cells. The cells were 4% PFA fixed (10 min), permabilised in 0.1% PBS-Tween (20 min) and incubated with the antibody (ab12209, 5µg/ml) for 1h at room temperature. 1%BSA / 10% normal goat serum / 0.3M glycine was used to block non-specific protein-protein interactions. The secondary antibody (green) was Alexa Fluor® 488 goat anti-mouse IgG (H+L) used at a 1/1000 dilution for 1h. Alexa Fluor® 594 WGA was used to label plasma membranes (red). DAPI was used to stain the cell nuclei (blue). ELISA using ab12209 at varying antibody concentrations. Curve_SPL4 indicates binding to the tri methyl K4 peptide ab1342. In addition, SPL3 indicates partial binding to the di methyl K4 peptide ab7768. There is very weak cross-reactivity with the mono methyl K4 peptide ab1340 (Curve_SPL2). SPL1 unmodified Histone H3, SPL5 Histone H3 mono methyl K9, SPL6 Histone H3 di methyl K9, SPL7 Histone H3 tri methyl K9, SPL8 Histone H3 mono methyl K27, SPL9 Histone H3 di methyl K27, SPL10 Histone H3 tri methyl K27. Overlay histogram showing HeLa cells stained with ab12209 (red line). The cells were fixed with 80% methanol (5 min) and then permeabilized with 0.1% PBS-Tween for 20 min. The cells were then incubated in 1x PBS / 10% normal goat serum / 0.3M glycine to block non-specific protein-protein interactions followed by the antibody (ab12209, 1µg/1x106 cells) for 30 min at 22ºC. 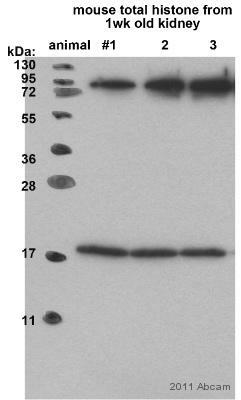 The secondary antibody used was a goat anti-mouse DyLight® 488 (IgG; H+L) (ab96879) at 1/500 dilution for 30 min at 22ºC. Isotype control antibody (black line) was mouse IgG1 [ICIGG1] (ab91353, 2µg/1x106 cells) used under the same conditions. Acquisition of >5,000 events was performed. Publishing research using ab12209? Please let us know so that we can cite the reference in this datasheet. Do you provide carrier-free antibodies, i.e. without addition of glycerol or BSA? I would like to couple your H3K4me3 ab12209 mouse monoclonal antibody and those factors decrease the coupling efficiency. I can confirm that Histone H3 (tri methyl K4) antibody [mAbcam12209] ab12209 is currently provided without BSA and glycerol. Any additional buffer constituents such as these would be listed on the datasheet in the buffer and preservative section. I am attempting to biotinylate the ab8580 H3K4me3 antibody using a kit that requires the antibody buffer to be free of BSA. Is it possible to order ab8580 without BSA, or even order biotinylated ab8580? >We currently do not offer ab8580 in a buffer which is free of BSA. When using our EasyLink Conjugation Kits concentrations of up to 0.5% BSA and 0.1% gelatin have little effect on the conjugation chemistry. As such I would suggest one of the following options. We are currently running a promotion through August for 25% off of any EasyLink conjugation kit by using the codeNEW-F76ZBby 31 August 2012. I just have a short question regarding the following antibodies: ab6002, ab9050, ab12209. Are those antibodies mono or polyclonal? When they are polyclonal, is it a serum or are antibodies purified? My issue is that I have to avoid RNase-decontamination, so I would like to know if the indicated antibodies are RNase-free! These antibodies are all purified antibodies. Note though, that we do not test for RNAse cactivity. The ab6002 is a monoclonal antibody IgG fraction, in Sodium Chloride solution containing Azide. The ab9050 is a monoclonal antibody purified by affinity to the immunogen (on a column with immobilized immunogen peptide), in a PBS buffer, containing Azide and cArginine (for stability). The ab12209 is a monoclonal antibody IgG fraction as well in PBS buffer with azide. I am interested in the following antibodies: H3K27me3 (ab6002) H3K4me3 (ab12209) Before I order, I would like to know, how the H3K27me3 ab is concentrated. Do you also sell the H3K36me3 antibody for ChIP, and if so, how is this ab concentrated? Do you have experience at which concentration and cell number those abs pull protein best? Both abs are named as ChIP-grade, are they also suitable for RIP and if so, which concentration would you recommend for it? I can confirm that H3K27me3 antibody (ab6002) currently in stock has a concentration of 0.6mg/ml and that we recommend to use 4µg for 106 cells in CHIP. We also offer a H3K36me3 antibody tested and guaranteed for ChIP: ab9050 https://www.abcam.com/index.html?datasheet=9050 https://www.abcam.com/index.html?datasheet=9050. The lots currently in stock have a concentration of 1mg/ml and we recommend to use 5-10 µg for 25 µg of chromatin. The optimal concentration for individual experiments always has to be determined by the users themselves. None of these antibodies (ab6002, ab9050, ab12209) is tested and guaranteed for RIP. Since they all work in CHIP, it is very likely they will also be suitable for RIP. Therefore, I can offer a discount off a future purchase if you buy ab6002, ab9050 and/or ab12209 now, test it in RIP and submit feedback to using our AbTrial program. For more information or to enroll in the AbTrial testing program doe untested applications and species please let me know. seedling, 300 mg fresh weight. I used antibodies that I know work as a positive control for the whole experiment. qPCR for positive controls used in various publications, e.g. 5' regions of housekeeping genes (actin, At4g04040, both of which are active in my tissue).